Paul Tisdale has reiterated his desire to re-sign Cardiff City striker Rhys Healey, but admitted he may have to look elsewhere if the deal takes too long to come to fruition. With no new news to offer during his press conference on Thursday with regards to the 24-year-old, Tisdale said: "We're not going to wait forever but I hope he's back with us by the end of January. "It's the same as before. We'd love to have him, but he's not our player." 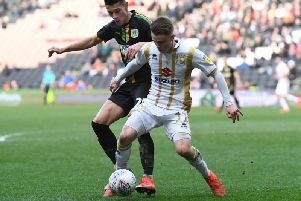 Dons had been primitively linked to Ipswich winger Jordan Roberts, but Tisdale was quick to dismiss the rumours. One person definitely through the door though is Russell Martin. The defender put pen to paper for Dons on Tuesday, adding strength to an already strong bank of defenders, according to his new manager. Tisdale added: "In isolation, the player and the person, I'm very happy with him joining us, he fits in nicely. No signing is a good signing until he has contributed but he's the right type of signing for us here at this moment. In terms of competition for places, you have to make choices as a manager. "We're looking for more than one signing, to strengthen areas where we are slightly weak, where we'd like to bolster or improve how we play, and then add strength in where we are already strong. "With this signing, I'm looking to add strength in depth to a position I feel is very important. We saw in December how we were effected by having Joe Walsh and Jordan Moore-Taylor out. That says it all. I don't want a repeat of that situation. "And we're looking at other signings for other reasons and other purposes. Generally, I would say Russell comes into an area of strength in our squad and strengthens it further."